Although I didn’t care much for the bungalow’s original owners’ decision to convert the front porch into a sunroom – shown below in all of its "BEFORE" glory – the awkwardly redesigned layout is precisely what lead me to the idea of designing a proper foyer, where everything from the walls to the color palette to the light fixtures beckons, "Come in, sit down, stay a while..."
Part of the space you see above was converted into a mudroom of sorts. 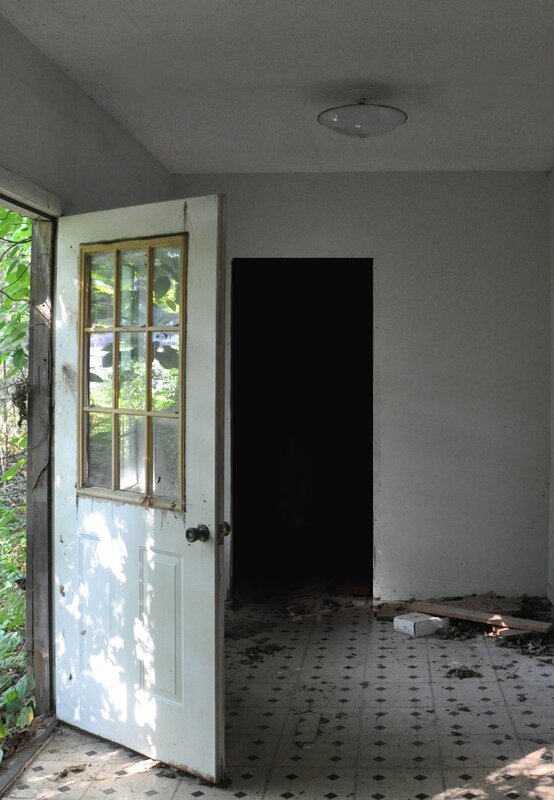 Yes, that is the small room you keep seeing pop up on my Instagram, but just so we’re clear, THERE WILL BE NO MUD IN THE MUDROOM, or anywhere else in the house, for that matter – which should explain my strong aversion to that strange term in the first place. Anyway, with all coats, shoes, mail, keys, purses, work ID badges, umbrellas and the other one million little things that typically clutter a foyer or an entryway conveniently stored away in this mudroom directly to the right of the front entrance, the foyer’s purpose will be purely decorative rather than functional – a fact that I am more than okay with, despite the limited square footage of the bungalow. If you ask me, making visitors feel welcome is as good of a function for a room as any, wouldn't you agree? 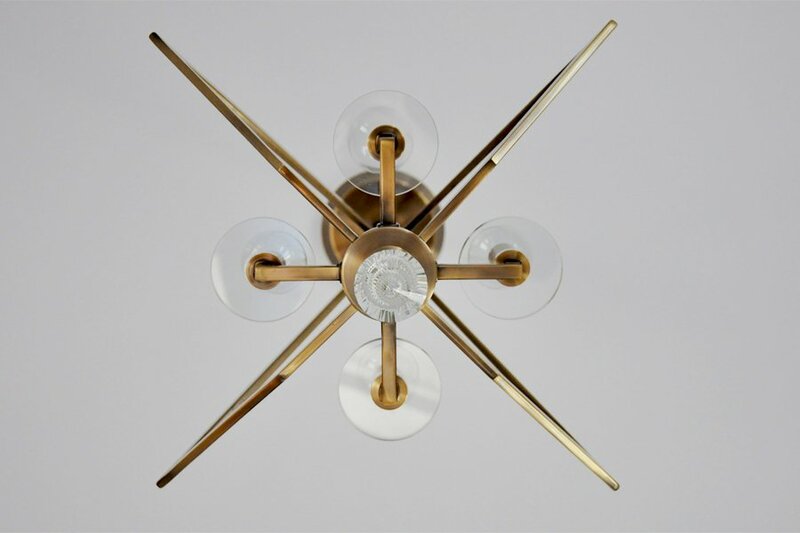 As far as the design of the space is concerned, a million ideas started spinning around my head when the nice people at Livex Lighting sent us the “Diamond” chandelier – or as I’ve lovingly nicknamed it, THE MOST GORGEOUS LIGHT FIXTURE TO EVER GRACE ANYONE’S ENTRYWAY. Yes, it is just that pretty and very deserving of the name. In some sense, the foyer is not unlike the opening act of a grand show: you have a brief moment of darkness and mystery to collect your thoughts before you walk into the spotlight. The transition from the dark gray of the foyer into the soft gray of the living room plays up this idea. 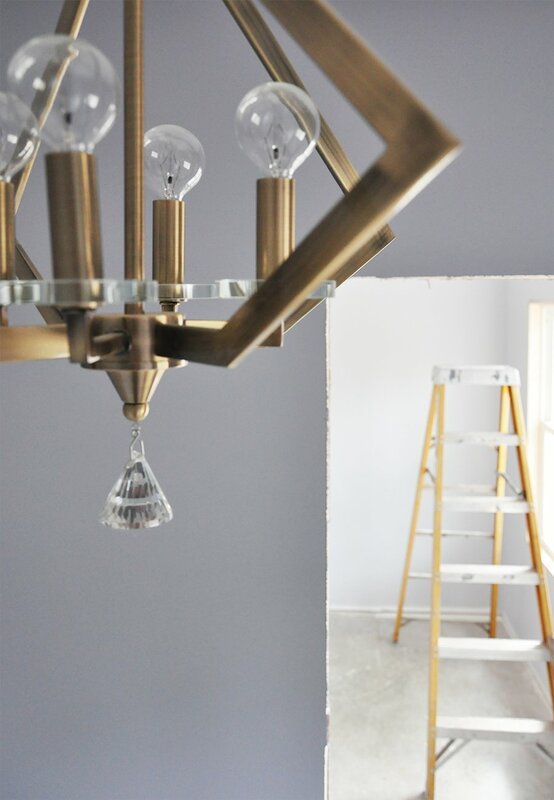 Speaking of color, I decided to paint the walls the color of the sky just before a thunderstorm – a moody yet somehow soothing gray with violet undertones that is very appropriately named “Let It Rain.” Despite its cool undertones, it’ll create a comfortable and easy transition from the outdoors, highlighting the warm undertones of the antique brass chandelier. 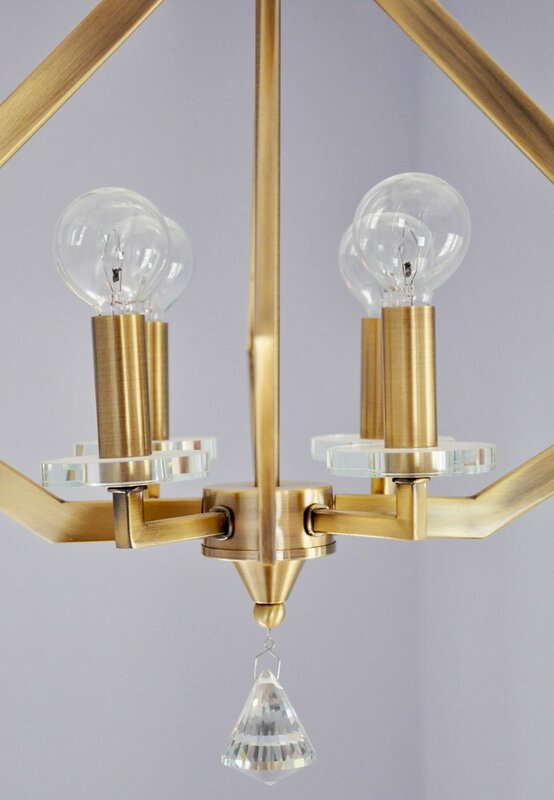 The rich combination of gray and brass is as contemporary as it is traditional – the perfect recipe for a modernized 1930 bungalow; more importantly, however, is that the blend of cool and warm tones allows for unlimited mixing of metal finishes throughout the rest of the house – not to mention the fact that it’s ridiculously pretty, wouldn’t you agree? 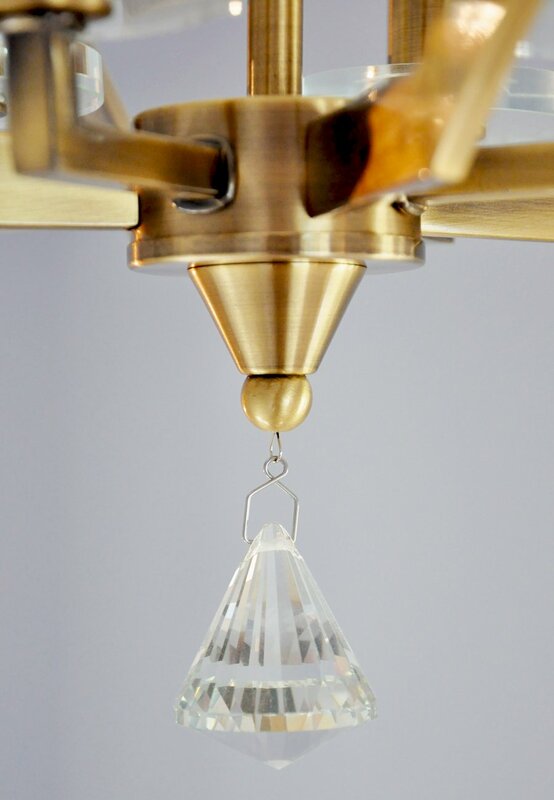 The crystal detailing on the chandelier adds an element of sparkle, especially when you first open the front door, and the diamond-shaped crystal at the bottom playfully reflects the sun's rays. What do you think of the progress so far? Which colors would you choose for your own foyer to make it soothing and inviting to visitors? 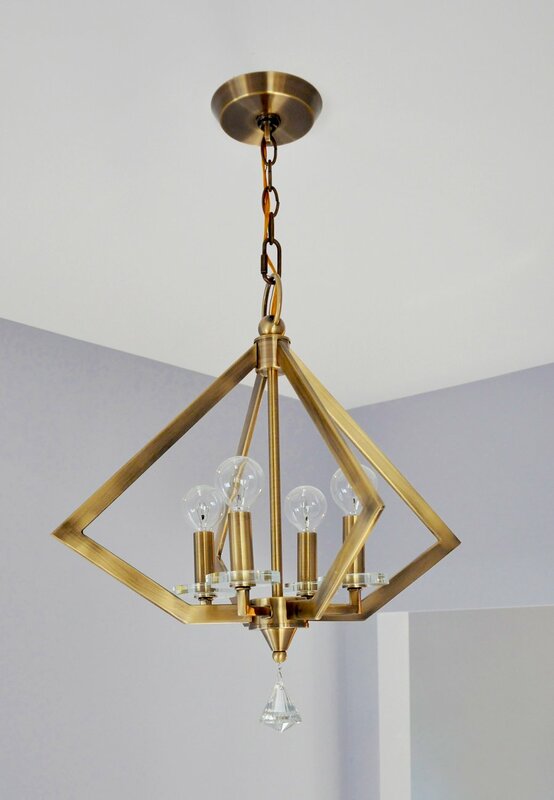 And how stunning is the Diamond chandelier from Livex Lighting? 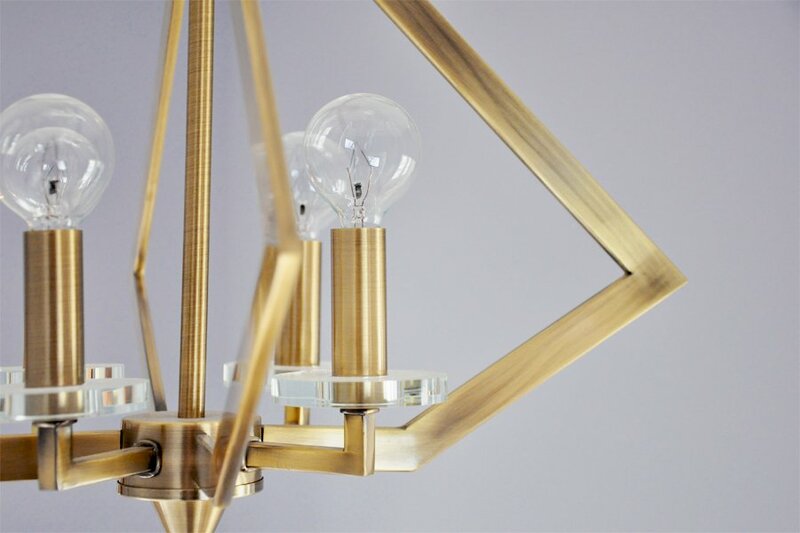 This post is written in partnership with Livex Lighting, who was kind to gift us the Diamond chandelier. As always, all opinions and words are my own. Thank you for supporting the brands that support this blog! 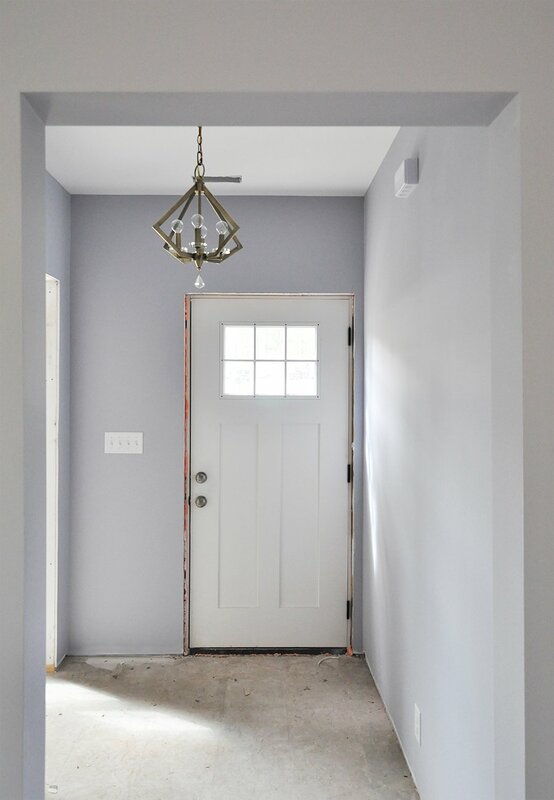 Posted in HOME DECOR, OUR BUNGALOW RENOVATION and tagged ENTRYWAY. I absolutely LOVE that chandelier! SO pretty! I love gold tones and accents, a foyer is an important space to look good 24/7! Drooling over that chandler! GORGEOUS! Great pic! OMG! That chandelier. GIVE IT TO ME ! I love that color and the chandelier is gorgeous. I can’t wait for my husband and I to purchase a house so we can start making it a home. Love the progress! I love how far you’ve come! That foyer is totally fabulous. I don’t understand why any owner would want to take away a front porch, I LOVE porches! You have seriously made that area so awesome! 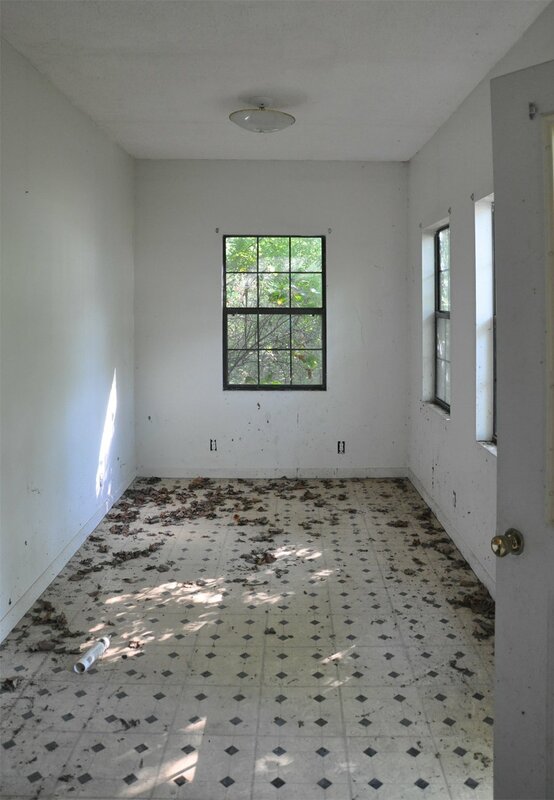 I can’t wait to see once you have it totally decorated! LOVE the progress so far! 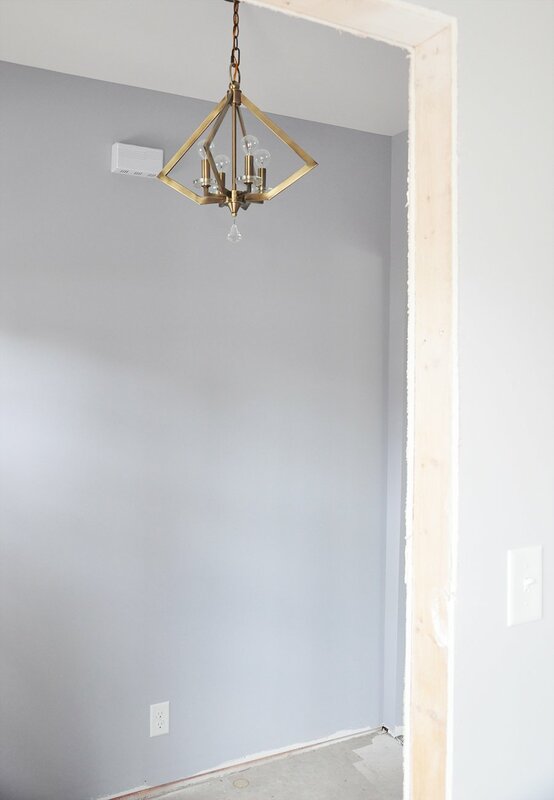 That paint color really opens up the space and I’m a sucker for a modern light fixture! This lighting piece is so pretty!!! Oh my gosh this is GORGEOUS! Do you want to come to my house and decorate/design?! That is so beautiful! I can’t wait to see everything all done. I am really enjoying following along through your process. 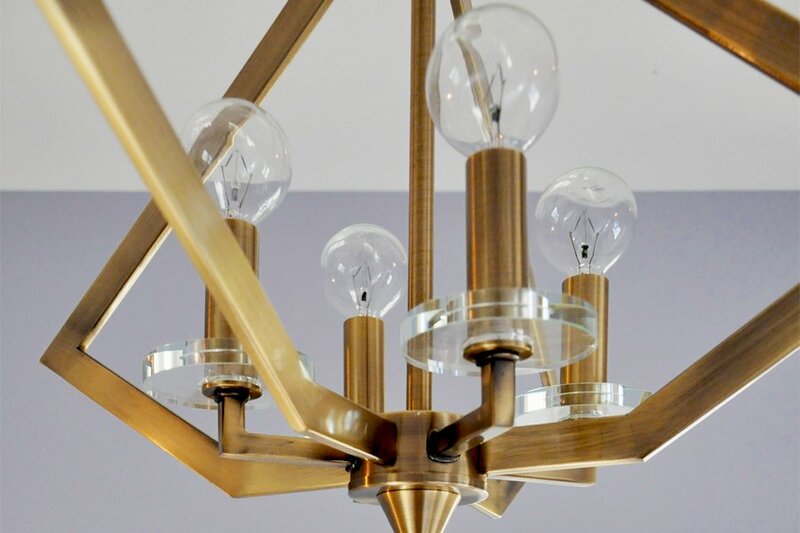 I’m in love with that light fixture! 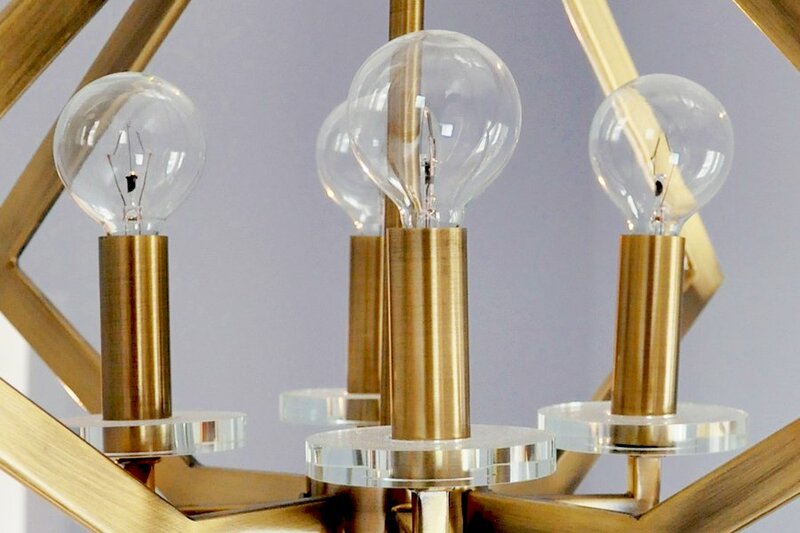 Wow that is a gorgeous light fixture! 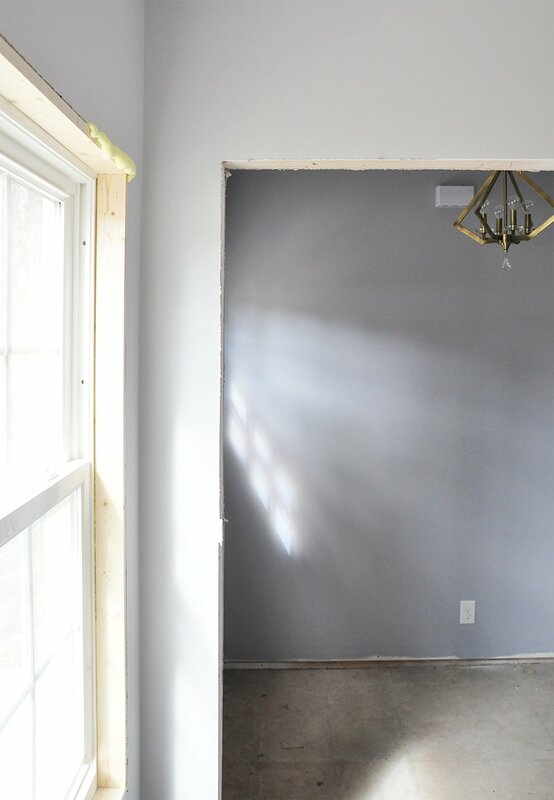 I get so excited when I read your home progress posts, still so excited to see everything when it’s finalized! That chandelier is so funky and unique! Love, love, love it!